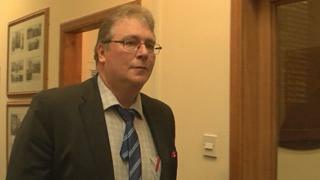 Colin Kennedy, whose actions at the Crofting Commission were the source of a row, has been unsuccessful in being re-elected after losing by two votes. Last year, the commission's board apologised for its handling of a dispute with crofters over the management of common grazing land. Board members also asked Mr Kennedy to resign as convener. He refused to do so. The count for the commission elections was held in Stornoway on Lewis. Mr Kennedy lost out to Billy Neilson in being elected as a commissioner for the constituency of South West Highlands. The former convener told BBC Alba that he did not believe the row had an impact on the election as he only lost by two votes. This is only the second time crofters have had an opportunity to elect commissioners, who serve five-year terms. The first elections to the board of crofting's regulatory body were held in 2012. The election involves six constituencies covering crofting in Argyll, Highlands and Western and Northern isles. Western Isles Council - Comhairle nan Eilean Siar - held the count. The local authority posted results on Twitter and live streamed declarations of the results on Periscope. Controversy has overshadowed the activities of the commission over the past year. Last month, Scottish ministers demanded "urgent action" after a report highlighted "worrying failures" at the Crofting Commission. A review ordered by the government found "personality clashes" amid issues with management at the group. There has also been a long-running row at the commission over its leadership and the management of common grazing land. Rural Economy Secretary Fergus Ewing said it was "essential" that governance was improved "immediately". The review followed a protracted internal dispute in the commission, which grew from a row over the running of land shared by crofters to raise livestock. Following the elections, Mr Ewing said: "Crofting is an integral part of Scottish rural life and it is essential that it has dedicated people to represent and reflect the interests and diversity of our crofting communities. "The elected crofting commissioners will give crofters a stronger say in how they are regulated, bringing valuable local knowledge and experience to the role and I would like to take this opportunity to congratulate the six newly elected commissioners on their election and wish them every success." He added: "This group, together with the appointed commissioners, will play an essential role in the effective governance and operation of the Crofting Commission, ensuring that it has the policies in place to deliver fair, reasonable and transparent decisions on matters affecting crofters and rural communities." Crofting Commission chief executive Bill Barron said: "I would like to congratulate those who have been elected and I look forward to meeting and welcoming them to the commission."